Owning a cat is awesome but accidents do happen. Although they can be the sweetest things in the world, cats will sometimes leave you with a little present in the corner of a room, on your carpet or somewhere else in the house. And when I say present, it’s not Christmas, I mean anything from throw up, pee and of course the dreaded poop. Pet accidents don’t happen every day but when it does you want to make sure you have the magic tool that will help you get rid of the stain and smell associated. We decided to put together a little selection of the best pet stain and odor remover and review them so you can choose which one fits your needs best. We also wanted to go the extra mile and give you some tips on how to use them efficiently. Here it goes! Don’t much time? Here is our selection (just click to see prices and reviews). If you want more detail, a more in-depth product review follows. First things first. We believe it is possible to get rid of those nasty stains with easy-to-find home products. By that, we don’t mean that the stain will disappear magically but that it is possible to use common household products to remove the stain AND the odor. It is usually enough but if it needs an extra nudge or if you do not want to bother, our best pet stain and odor remover will come in handy. Use the recipe below to remove stains from carpets, clothes, and even bedding! Before anything: if you are cleaning a pee stain, do not use bleach or any other product containing ammoniac. This will only worsen the odor and will not prevent our little friends to come back and start again. Step 1: clean up as much as you can with paper towel/sponge by pressing into the floor; do not wipe. Use sparkling water to start cleaning the stain, for instance. Soaking up as much as possible is the ground rule to clean the stain properly. Step 3: Pour your mix in an empty spray bottle and spray it liberally on the stain. Step 4: Let sit for 10 minutes and rinse with water. Step 5: Repeat the process as many times as required to get rid of the stain. Whatever way you decide is best, act fast! It is very important that your cat does not identify the smell of pee on your carpet or wherever he did what he did. One thing you want to avoid is your cat starting again. Step 1: Remove as much as you can of whatever was stained with newspapers or paper towels. Step 2: Rince with cold water (even if the stain has set in), this will start to clean and prepare the stain for the next step. 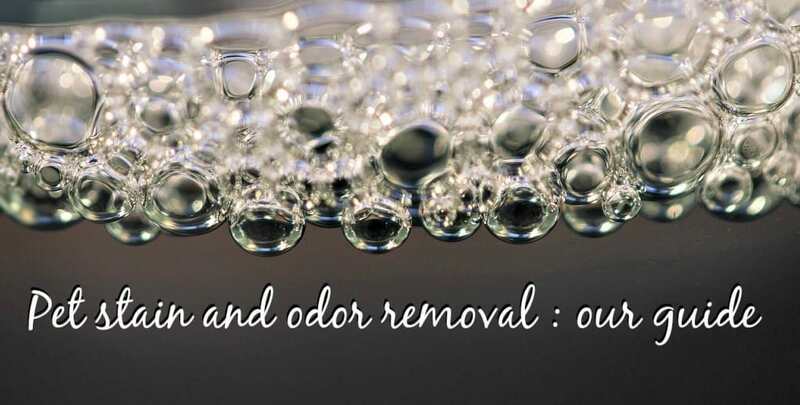 Step 3: Use one of the best cat stain and odor removers. Apply generously and follow the instructions provided with the product. Let’s see which on of those products you could choose from. The Rock Star of pet stain and odor remover! 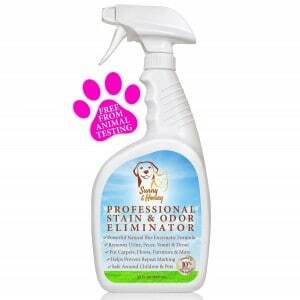 It’s an all in one that really takes care of any pet related stains in your house. 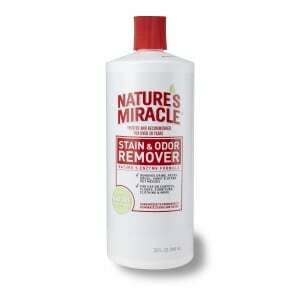 Their bio-enzymatic formula works like a charm to take off those dirty and suspicious stains. We chose the Rocco and Roxie in the first place because it was highly recommended from our friends. If you have a glance on Amazon, you will see that thousands of people have tried it and loved it. No wonder it became a best seller! To sum it up, this is our n°1 choice because it’s a spray, super convenient to use and it just works great. Cool thing about this product? You don’t like it? You get your money back! Another great option for lower budgets. It costs around $5! This one is also a top seller and approved by thousands of satisfied customers. It contains Enzymes, Isopropyl Alcohol, and a natural Citrus Scent. It’s pretty easy to use, just by soaking the stained area. Depending on how long the stain has been sitting, you may have to repeat the procedure but in the end, it gets the job done just as well. Also, for a couple cents more, you can get the spray version that makes it even more convenient. 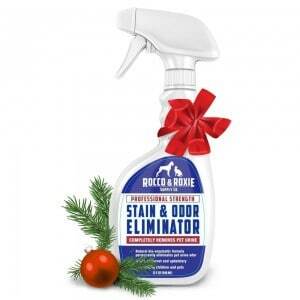 Another formula with it’s own bio-enzyme mix that will destroy any stain and smell associated. We discovered this one more recently and it’s just awesome. What we like about this product (not mentioning the fact that it works very well) is that they really made sure it was risk free. For your children and for your pet, this product is free of harmful chemicals and you can use it on almost any surface. Moreover, it’s also certified by the Carpet and Rug institute. 🙂 Another proof of quality. We believe this product could soon outrank our number one Rocco & Roxie. Definitely, a must have for anybody willing to get rid of the toughest stains! Finally, if you want to make sure there is no other area where your cat/dog peed, or if you simply want to be absolutely sure that the stain is removed, there is no other way to know (maybe call the FBI 😉 ). This black light will reveal any pee stain remaining so that you can use your favorite pet stain and odor remover. We hope that your are now stain free and that our best pet stain and odor remover reviews helped you find a great way to get rid of the mess. Whether you used our homemade recipe or the good’ole way, we truly believe it’s now easier than ever to gain control over your little friend’s accidents. Above all, stay prepared and follow us on our social media or simply leave a comment down below where we will be more than happy to reply. 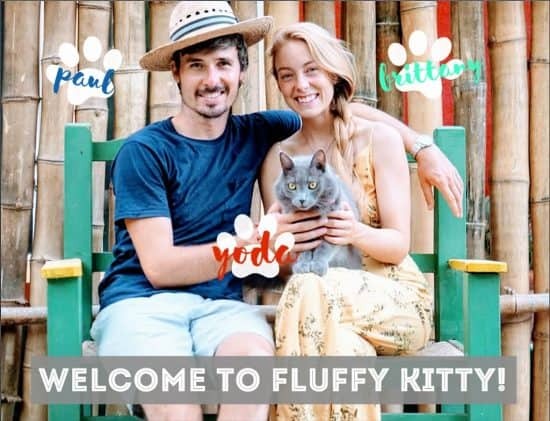 Thank you for your trust and see you soon on Fluffy Kitty!